A hearty, make ahead and freezer friendly meal with loads of veggies snuck in for those picky eaters! A meal the whole family is sure to love! Forgive me if you’ve heard me say this about half a million times, but I am a bit of a picky eater. This doesn’t mean that I don’t eat healthy most of the time or that I live off toast and mac and cheese or anything like that. It just means I’ve gotten smarter about where I can put those veggies I don’t really like to eat. Maybe you have a picky eater in your house (maybe one of your children and not you, because you surely eat salads and stuff like a totally responsible adult), and maybe you’re looking for healthy, hearty meals that those picky eaters will enjoy. As I’ve learned to cook Real Food over the last 10 or so years (and yes, I started with Shake ‘n’ Bake and boxed pastas back in my first year at University…), I’ve also learned the best places and flavors to hide those vegetables in. Barbecue sauce, chili and cheese? I made this recipe twice, and the first time I really loaded the chili up with all kinds of vegetables. The second time, and really only because of the time involved (and the whole cooking-with-a-one-year-old-wrapped-around-my-legs thing) in the peeling/shredding/chopping off the veggies, I cut out a few. I’ll be the first to say you’ll never really notice a difference in flavor, so load this baby up with all that good stuff. I used kale because I had a huge amount in the fridge, but spinach would be a find substitute. You could also add in mushrooms, corn or other vegetables your family likes (or doesn’t like but you want them to eat!). 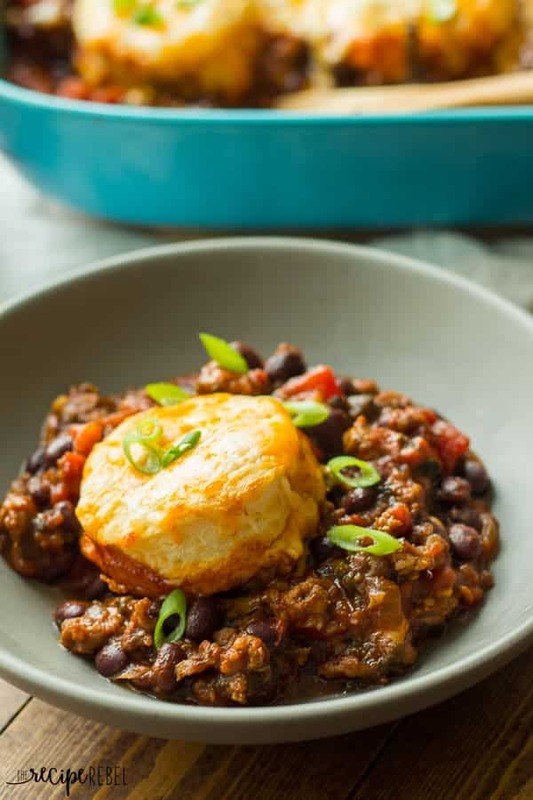 You can buy refrigerated biscuit dough and plop it on top of the chili instead of making your own, though the biscuit dough in this recipe comes together easily in the 10 minutes you simmer the chili on the stove. If you’re really in a time crunch, you can use canned chili or chili you’ve made ahead and frozen. A hearty, make ahead and freezer friendly meal with optional hidden veggies! A meal the whole family is sure to love! ChiliIn a large oven safe skillet or dutch oven, cook ground beef and onion over medium-high heat until browned. Add in carrot, pepper, kale and chili powder and cook 2-3 minutes until veggies are softened. Add beans, tomatoes, ketchup and barbecue sauce. Cover and simmer over medium heat for about 10 minutes so the flavors can come together. Meanwhile, make your biscuits. BiscuitsIn a medium bowl, stir together flour, baking powder, salt, and garlic powder. Cut butter into ½" cubes and add to the flour mixture, cutting in until crumbly. Stir in milk gradually, stirring in just enough that the dough comes together. Roll out on a floured surface and cut into biscuit rounds if desired (or just leave it as one piece). Place biscuits on top of chili mixture, lay a piece of tin foil over top (don't tighten around the dish -- this is only to prevent splatter in the oven. You don't want it too steamy or your biscuits will be soggy) and bake for 10 minutes until light golden brown. Sprinkle with cheese and bake 1-2 minutes until cheese is melted. Serve. To make ahead, cook chili for the 10 minutes and make biscuit dough. Wrap biscuit dough in plastic wrap and refrigerate. Cool chili to room temperature and refrigerate. When ready to bake, bake chili, covered, at 450 for 10-15 minutes before adding biscuits to top and baking an additional 10 minute and proceeding with recipe. To freeze, assemble completely, minus the cheese, and freeze. To bake, thaw in the fridge overnight or on the counter for 2-3 hours. May require additional baking time if still partially frozen when you bake, but it will be fine! Sprinkle on cheese just before it's finished baking. In a large oven safe skillet or dutch oven, cook ground beef and onion over medium-high heat until browned. Add in carrot, pepper, kale and chili powder and cook 2-3 minutes until veggies are softened. Add beans, tomatoes, ketchup and barbecue sauce. Cover and simmer over medium heat for about 10 minutes so the flavors can come together. Meanwhile, make your biscuits. In a medium bowl, stir together flour, baking powder, salt, and garlic powder. Cut butter into 1/2″ cubes and add to the flour mixture, cutting in until crumbly. Stir in milk gradually, stirring in just enough that the dough comes together. Roll out on a floured surface and cut into biscuit rounds if desired (or just leave it as one piece). Place biscuits on top of chili mixture, lay a piece of tin foil over top (don’t tighten around the dish — this is only to prevent splatter in the oven. You don’t want it too steamy or your biscuits will be soggy) and bake for 10 minutes until light golden brown. Sprinkle with cheese and bake 1-2 minutes until cheese is melted. Serve. To make ahead, cook chili for the 10 minutes and make biscuit dough. Wrap biscuit dough in plastic wrap and refrigerate. Cool chili to room temperature and refrigerate. When ready to bake, bake chili, covered, at 450 for 10-15 minutes before adding biscuits to top and baking an additional 10 minute and proceeding with recipe. [br]To freeze, assemble completely, minus the cheese, and freeze. To bake, thaw in the fridge overnight or on the counter for 2-3 hours. May require additional baking time if still partially frozen when you bake, but it will be fine! Sprinkle on cheese just before it’s finished baking. [br]**NOTE: Nutrition information is estimated and will vary depending on exact serving size, types and brands of products used. More chili recipes to love! « 25 Hearty & Healthy Soups, Stews and Chilis! WOW!! 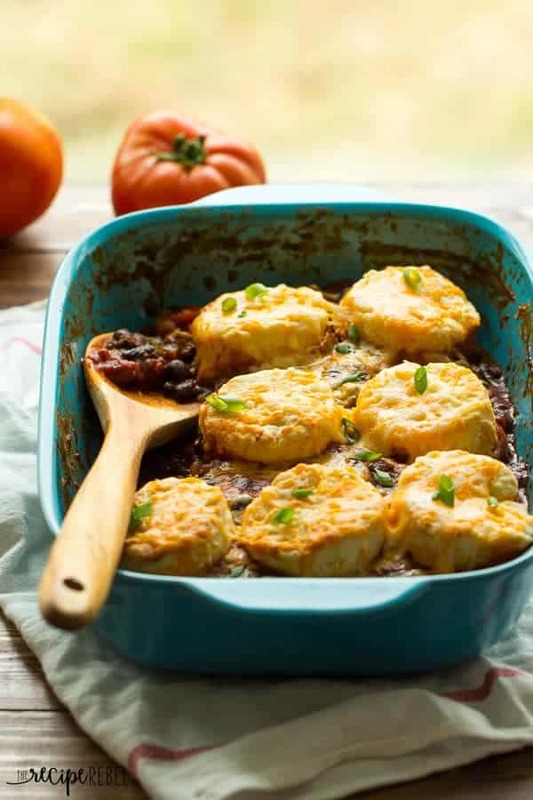 Amazing casserole, the combination of the flavour and the vegetables make this dish one the best casserole, my friends enjoy a lot .Good job and thank you for sheering your delicious recipes. Thank you so much Norma! I’m glad you liked it! Oh mah gooooosh! This casserole is EVERYTHING! Seriously, ALL the swooning going down right now because this looks just too good! 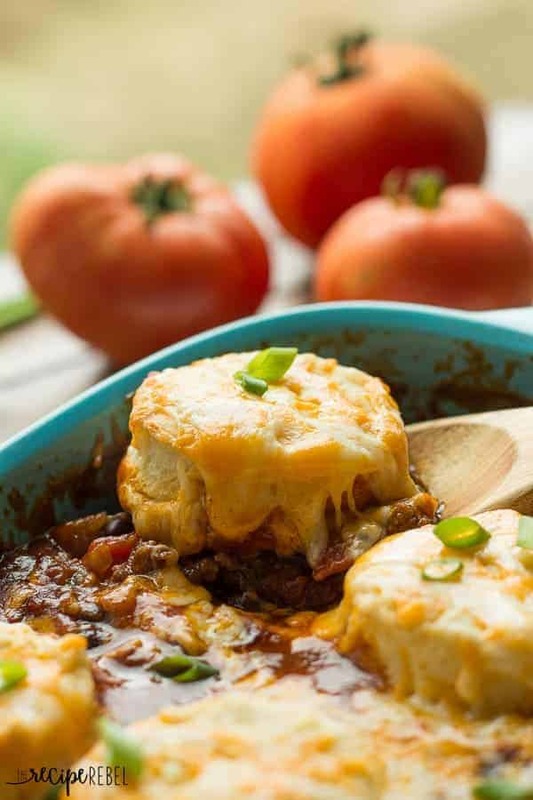 Really, there is just no beating biscuits chili, bbq, and cheese all hanging out in one pan! This looked so good on Instagram that I had to come check it out. Looks even better on the bigger screen. Yum! I love a good old BBQ chili. And topped with biscuits??? Doesn’t get much better. I love that you load it with veggies. Get them where you can! What great comfort food! This casserole would disappear in a hurry around here! Thanks Jessica! I know it did here! Mmmm comfort food… looks delicious! Veggies snuck in = winning. Chili with bbq sauce sounds delicious! Yum! This casserole looks SO flavorful and amazing! My son is definitely starting to become a picky eater so I am loving all the veggies you snuck in here! Yes to the cheese, bbq sauce and chili! It’s the perfect comforting dish! Thanks Kelly! Sometimes it’s the only way I can get them all in — and you never taste them! oh my gawd, Ashley!!!! this looks amazing!!! damn, I want a biscuit now!!! Happy New Year! Haha, thanks Alice! Happy New Year to you! It’s definitely the season for this type of food, especially with football on every week. Chili is at the top of the list when it comes to comfort food! I totally agree! This would be perfect for those game days! Hi Dorothy! I’d love for you to send me some of your chili recipes to try! [email protected] — thanks! Was that your first snow?!? We only got snow about the middle of December which is really late for us, but I’d been waiting for it for so long! Now I’m almost ready for Spring 😉 I wish we were having chili for supper tonight! This chili is mouthwatering. I love that vegetables are hidden throughout. And the biscuits are the perfect way to top chili! Happy New Year, friend! I love how you snuck some veggies in here, Ashley! My husband is sort of picky too, so I bet he wouldn’t even notice the kale and carrots in here. 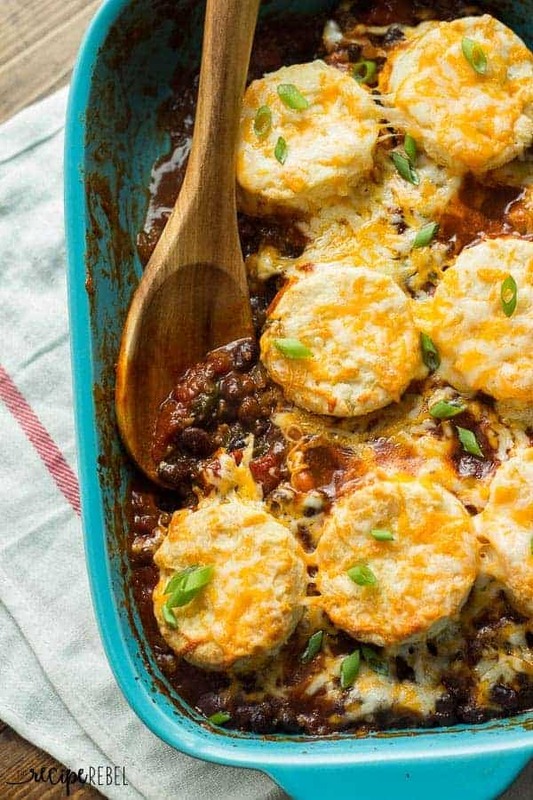 And I love any kind of chili, so this biscuit casserole sounds amazing! This looks like the perfect comfort food for the snow that headed my way!